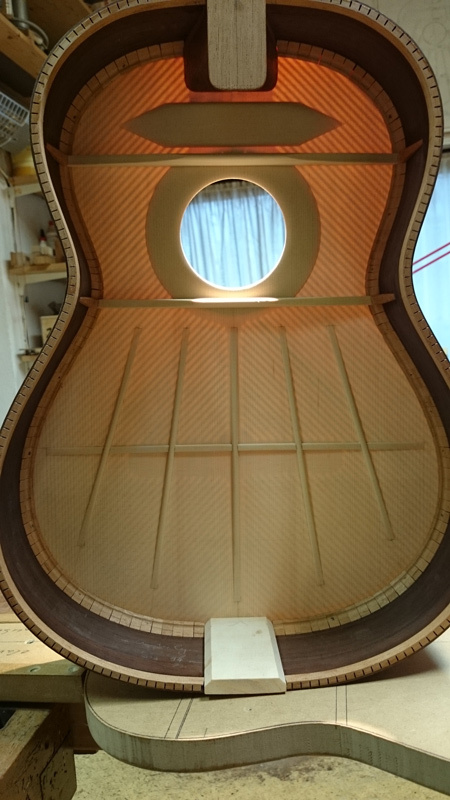 For a long time there has been an ongoing fight between the advocates of traditional guitar building techniques and the supporters of modern methods. For the past 20 years there have been new concepts like Lattice Bracing, Double Tops, and Sandwich or Composite Tops. Often the argument between these two sides takes on a vicious and uncompromising nature, which I have never fully understood. 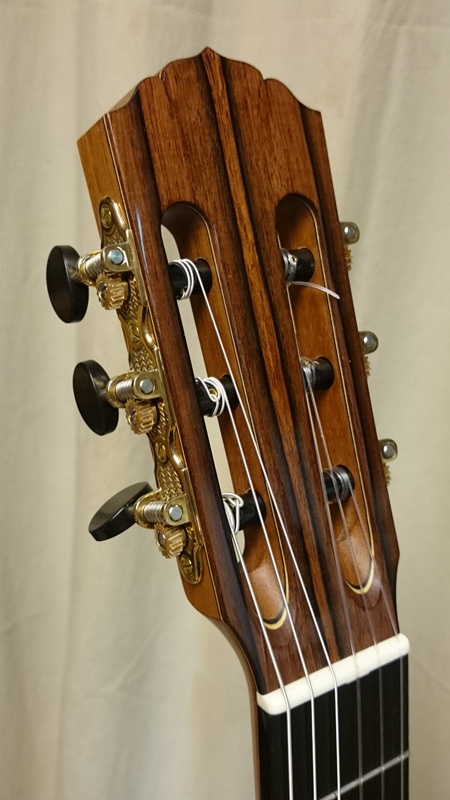 Anyone who has studied acoustics, the music of different eras and their associated performance techniques has surely realised that there cannot be a guitar that can do everything. For example, if you want to fill Carnegie Hall with sound without the use of a microphone and amplifier you will need a different instrument from that which you might use for a CD recording, where every fine detail of dynamics, colour and phrasing is of utmost importance. 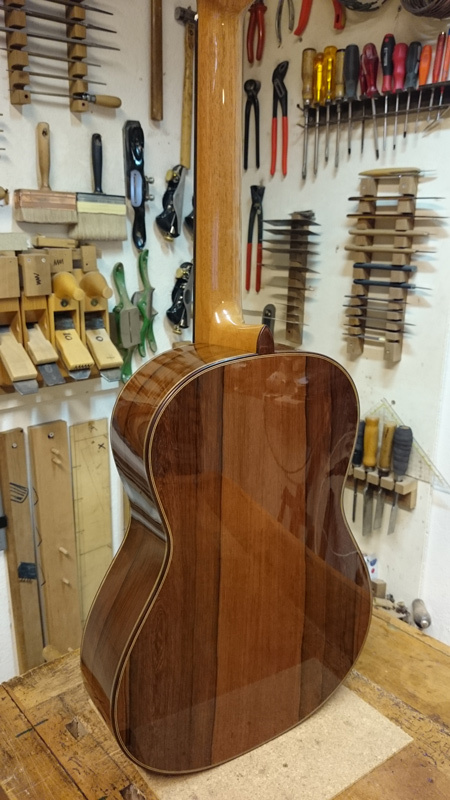 I have been inspired and supported by friends and colleagues such as Gernot Wagner and Antonius Müller and have been intensively constructing Double Top guitars using different techniques for the past 10 years. During the 20 years before that I was instructed exclusively in the traditional Andalusian method by my friend and teacher Rolf Eichinger. I found the new materials and procedures at first a great challenge, but they also gave me great pleasure as I could once again experience the pioneering feelings of discovering the unknown that I had felt during my first years of building. I of course again made plenty of frustrating mistakes! I owe the two aforementioned colleagues particular thanks, because though their generous help and openness they managed to reduce my number sleepless nights considerably. 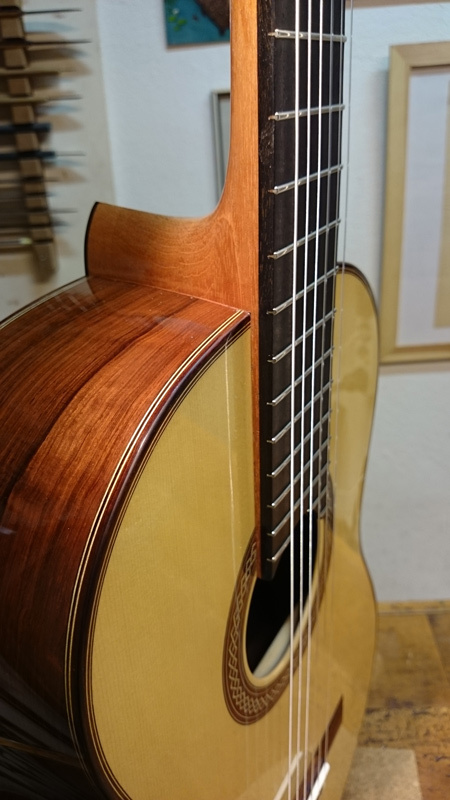 Having seen their amazing instruments I was quickly convinced that the traditional and modern methods need not be fighting each other, but should rather be working together to to further the richness of the guitar in modern times. The idea behind the new construction principles is to reduce the mass of the top without adversely affecting its elasticity and stiffness. This is done by hollowing out the inside of the top and filling it with a less dense supporting material e.g. Nomex or balsa wood. Therefore the vibrating strings have to overcome less resistance (the impedance has been reduced) in order to move the acoustical plate i.e. the top. The aim is that the guitar sounds louder and the notes last longer. Of course that must all go hand in hand with a high structural stability and long lifespan. Due to the new construction techniques the number of variable parameters is increased. Not everything works and automatically gives good results. Like walking on a tightrope, one needs to always adjust to achieve the right balance. As a result neither more nor less excellent guitars are built with these new methods in comparison to earlier times. To conclude I’d like to make one more remark. Almost everybody who builds in the traditional way follows the work of Antonio de Torres, who lived from 1817 until 1892 in Southern Spain. In the generation after him, the most outstanding luthiers such as Hernandez, Garcia, Ramirez and Hauser, certainly followed his example. Since then many generations of luthiers have with good reason tried to follow in his footsteps. It is however often forgotten that Torres himself did not directly learn any guitar building traditions. If Torres was alive today how would he have built guitars? Like the “Torres” of 200 years ago? I think such a free spirit would rather always be full of new ideas. Trying things out, changing things, inventing. He would perhaps be a path finder for generations to come. Of course that is speculation! I for my part have stayed away from the fight I mentioned earlier and therefore can take great joy in building guitars using both the traditional and modern methods.